I moved into my new place in Washington Heights a few years back. The building on the next block, facing Broadway, is one of those massive, featureless apartment buildings with permanent scaffolding all around and a heavy rotation of store fronts. On the corner there was a chinese restaurant with a ‘C’ rating and Nixon era linoleum. The teller was stationed behind perspex and the door to the kitchen was made of iron bars. Next door was a drug store run by indians which closed at 5PM. Then came the cell phone store and then the Yemeni “Deli” which sold mainly beer, loosies and TP. The cell phone store was abandoned a while back, the lights remain on and all the free standing marketing materials are still there, even the Visual Display Unit, a huge, propped up cell phone that shows the company’s great money saving deals on its screen, is still in the window and still plugged in, running through their offers and services with attractive bullet points. On the floor next to the cell phone is a black garbage bag full of paperwork; the full extent of the clean up. The deli closed because, as it turns out, they had no liquor licence. The Chinese place and the Drug Store both leaped two stores to the left, leaving two grimy shells vacant and what do you think moved in? Another hairdresser ? A taxi dispatcher? Nothing? No; a Bookstore! That’s right. My God, I thought, in this neighbourhood the rent is so freakin low, even literature can be profitable. 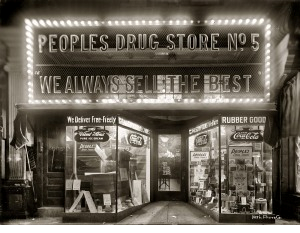 It turns out that the abandoned drug store had always been a drug store. When they moved down the block they took their awning with them and underneath was one of those cool, old timey signs made of deep tin letters filled with neon. ASCOT DRUGS. This is where the bookstore moved in. At first it had the kind of selection you might find going for .25 cents a throw on a folding card table at a New Jersey yard sale at four PM. The window was chaotic – a few books thrown onto a vegetable rack. But gradually things improved and I picked up three classics for a buck each there last night. Word-up is (in their words) a multi-language, general-interest bookshop committed to promoting literacy & community-building in Washington Heights. By hosting workshops, literary readings, and musical engagements for kids and adults, we do our best to support and fortify the creative spirit unique to our diverse, Uptown community. And it looks as if they are succeeding. It’s a warm, inviting place with a small stage in back and there’s something going on there pretty much every night. Poetry, live music, readings. OK, it’s subsidized and its employees work for free, so it’s not a business in the strictest sence but still, they sell books, so hey.. It appears that in areas that do not have astronomical rent, like Greenpoint, established smaller bookstores , selling both new and used titles are, if not exactly thriving, at least staying the course. Hopefully as the big bookstores continue to collapse under thier own weight, more new stores will be springing up in the cheaper zip codes & neighborhoods trembling on the brink of gentrification. Also there seems to be a hard kernel of readers who point-blank refuse to use the Kindles and Nooks that arrived unbidden in their Christmas stockings. They distain technology & prefer The Feel of the Real. Is this a big enough demographic to sustain a new wave local booksellers or is this the last hurrah before we bend to the inevitable and books become Kind of a Luxury Item? Comments? Any great new bookstores out there that we should know about? CODA: Word Up closed its Wash Heights location in Sept 2012. This entry was posted in books, kindle, Manhattan, new york retail, Paradigm Shift, retail, Uncategorized, Used Book Business and tagged books, Kindle, used bookstores. Bookmark the permalink.